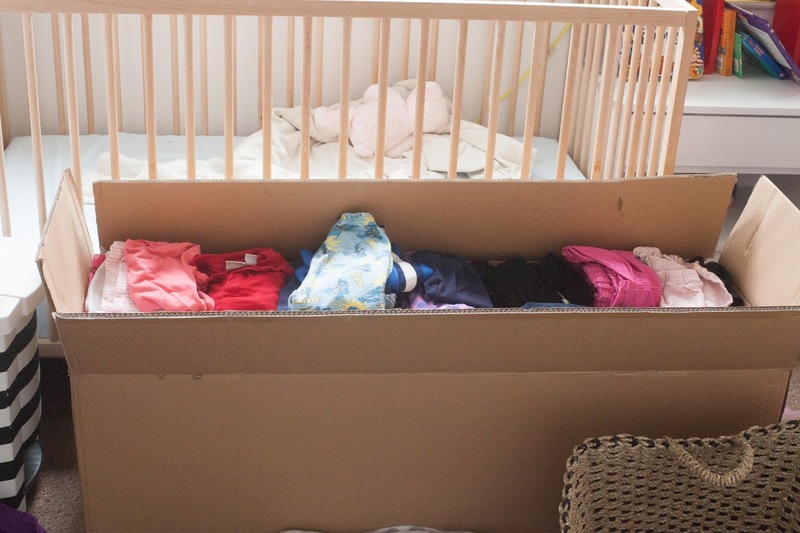 To recap: about a month ago, I packed up the majority of my kids' clothes. I left them with (what I felt was) the basics, the minimum amount to keep them clothed for a few days. The idea was to practice living with less, and to assess the impact (hopefully positive!) it had on my laundry-induced insanity. Laundry is the worst. Ugh. To sum up: You guys. It's been SO awesome. Save for one tiny emergency (walking out the door and someone peed his last pair of pants...so into the box we dove for a clean pair), we haven't missed the clothes at all. We haven't felt a serious "lack" of clothing. We still get behind on laundry sometimes...but we feel the pressure to catch up sooner, and getting "caught up" is just a few loads away...not, like, EIGHTY FIVE. Also, I actually ended up doing this with my own clothes, about a week and a half in to the experiment with my kids' clothes. I have learned a lot. And since each thing I learned is kind of its own little thought, kind of like a mental bulleted list anyway...a bulleted list is what you get! -There was remarkably less mess on the kids' bedroom floor! Maybe I was better about reminding them to put their clothes in the laundry when they changed, or maybe there was just less to get strewn about...or both...but their floors stayed so much cleaner. Awesome! -Less "costume changes." I'm thinking of my oldest, in particular. When met with many, many dresses to choose from, she goes into dress hyper-drive and changes FOUR times a day. I'm not kidding. With less to choose from, she often took more time deciding what to wear in the morning...and then almost always stuck with it until the bitter end of the day. That was surprising, though it makes sense in hindsight. -Laundry is no longer an overwhelming chore. I do not do well with one big "Laundry Day" where I commit to doing all of the laundry that has piled up over a week, or several days. Laundry feels so bossy in that situation! (Taking up my whole day?...Rude! Ha). In my previous post, I mentioned that doing one load of laundry every day is usually just enough to stay on top of our laundry in this family. BUT!...knowing that and doing that aren't always the same thing...and when we would get behind, for whatever reason, we were staring down this HUGE backlog-of-a-chore in order to get caught up. And truthfully? Because there were many, many "second-string clothes" (the clothes you only wear when the ones you actually like are dirty)...there was far too much potential to keep procrastinating (which, of course, only made it worse). With less, we ran out of clothes more quickly...which, really, was a blessing in disguise. If I slacked on laundry once-a-day, then we NOTICED by day two...and were hurtin' for clothing by day three. I would do a couple extra loads to get back on track, and ta-daa! Caught up. So much better. Three short-sleeved shirts, Two long-sleeved shirts, One sweater. -We learned to appreciate the clothes we have. This one was the biggest. We had to keep track of where clothes went. We had to be diligent about removing stains and making minor repairs. We had to keep them clean. 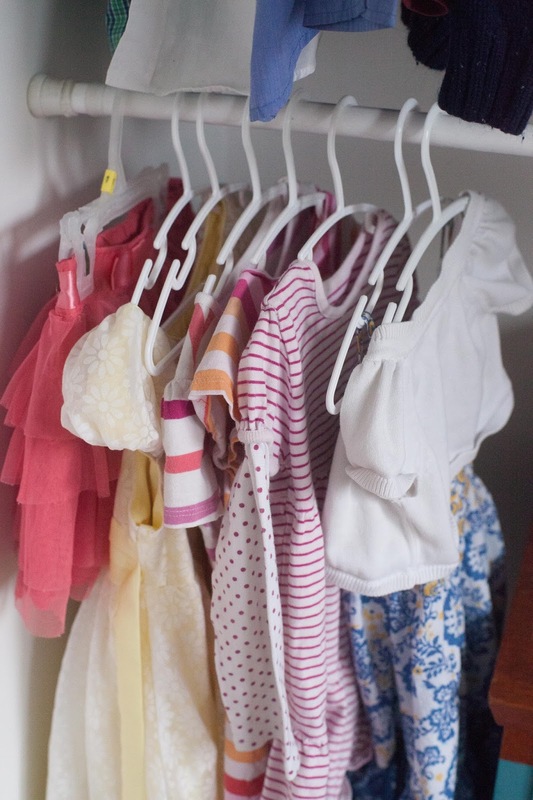 -I learned which clothes really work for my kids, as in which styles/patterns/fabrics. I learned that my littlest baby does best with darker patterned tops that hide avocado and berry stains, and one-piece outfits were awesome for keeping track of a whole outfit (less pieces to gather!). I also learned she needed more onesie-undershirts than I had thought...she went through them fast! I finally faced the fact that my oldest daughter loves dresses, period. I intentionally kept out two pairs of jeans to see if she would choose them with less choices...and she didn't wear either of them once. She would be perfectly happy with a wardrobe of only dresses and leggings. I learned that I need to buy my boy shirts in colours and patterns that better hide snot and mouth-wipes and dirt. Yeesh. Someone teach that boy to use a tissue. And napkin. And soap. Who's his mother, anyway? 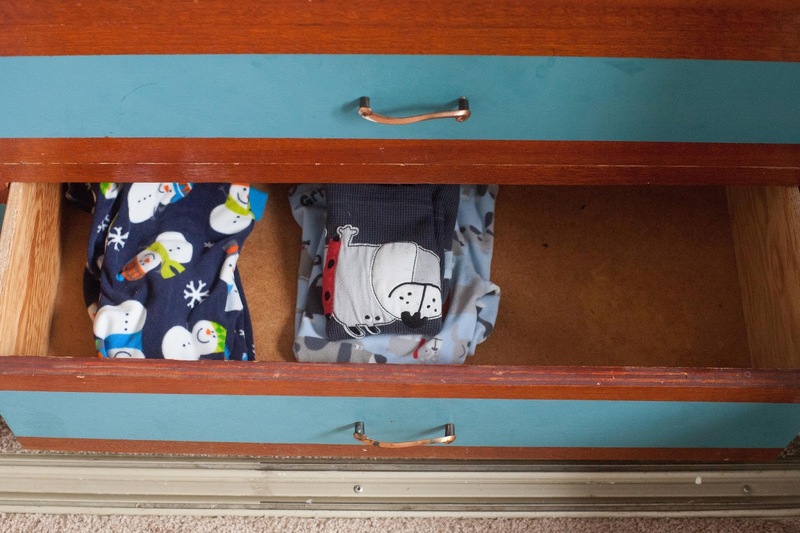 earn the space it takes up in the closet or drawer. 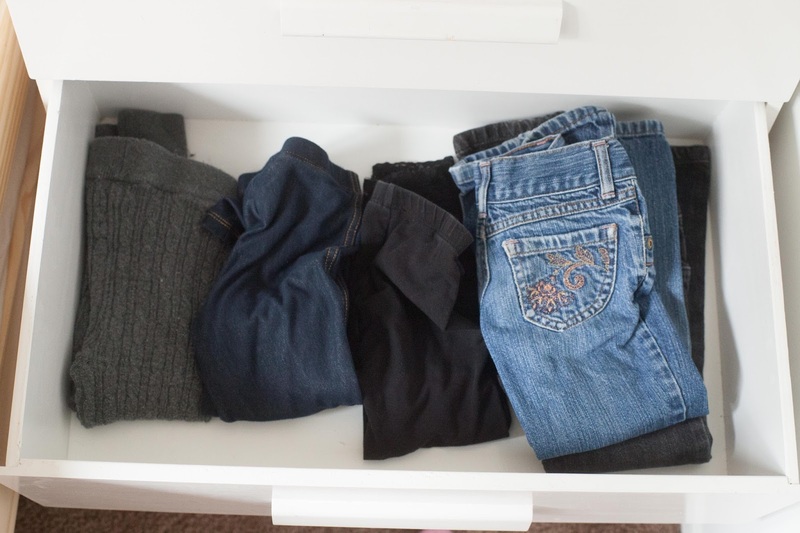 Three pairs of leggings, two pairs of jeans. Both jeans went untouched the whoooole time. -And then there's that mysterious, spiritual thing that happens when you live with less. Know what I'm talking about??? 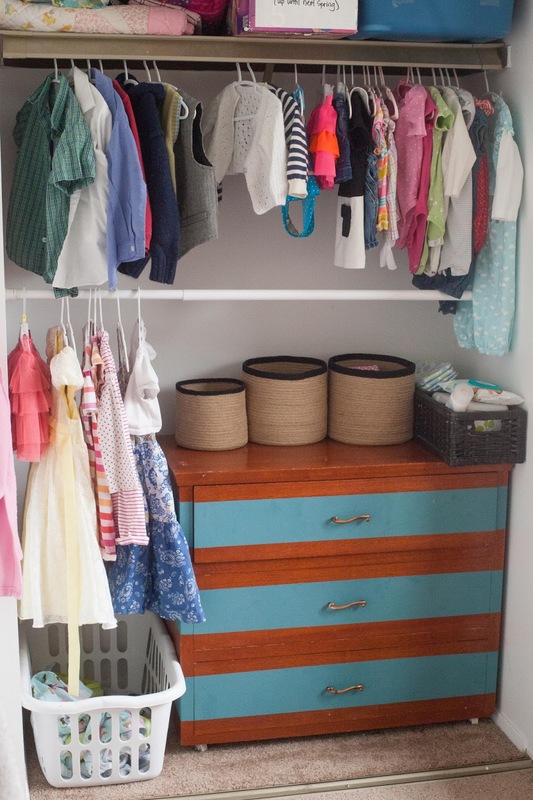 Just...the less clutter, less stress, greater appreciation and gratitude for what we have...no desire to add more...in fact, I kind of panicked when faced with the idea of picking up more clothes at a garage sale about half-way through this. The clothes were SO cute! And cheap! BUT...when push came to shove, I just had zero desire to mess with The Zen of Minimal Clothing we had going on. Ha! Seriously, though. 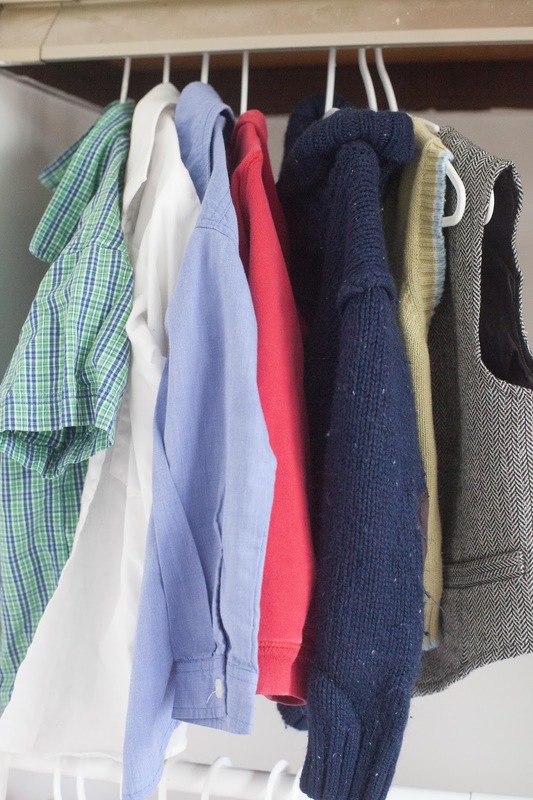 Boy: one casual collared shirt, two Sunday-best shirts, one sweatshirt, one sweater, two Sunday-best vests. Not pictured: three short-sleeved shirts, two long-sleeved shirts, four pants (one jeans, two khakis, one sweatpants), two pairs of shorts, and three sets of jammies. -The kids did wear out clothes a little more quickly. There were a two shirts that got worn and abused so badly that they were toast. But with that also came the satisfaction of knowing they had been well-used, loved, stretched to the maximum...stains had been removed (and replaced with new ones...ha.) and repairs made until it was time for it to retire. RIP bunny t-shirt. You were adored. Three play dresses, two Sunday-best dresses, one skirt, and two cardigan-type sweaters. Not pictured: three sets of jammies. -On that note, when something wore out, I knew exactly WHAT needed to be replaced...and that it actually NEEDED to be replaced; it was one of five shirts! That was refreshing to not have to think about it and weigh out whether they actually needed it or not. They just did, because they were already living on simply what they needed. -I did the experiment right in the middle of a seasonal change, which mean that the thick, Winter PJ's I had kept out didn't work as well when the weather warmed up. Oops. -I like change; and I often have to immerse myself in a situation in a temporary way (like this extreme experiment) to experience what it would feel like to live that way. But I think if I was one who didn't like things changing so fast, so drastically, I would try just taking one or two things out of my closet every few days. I wouldn't have to give it away right away (if it helped me feel better about pulling it out)...then if I found I didn't miss it, I'd give it to someone who would love and appreciate it better than I could. Baby's Clothes. She had two other pairs of PJ's in a basket, as well as three pairs of leggings and two pairs of tights. Above is two sweaters, two skirts, three dresses, three shirts, 5 onesie-undershirts, three rompers, one footsie PJs. At this point, all the kids shared one room. Love this Laura! I still haven't taken the plunge. I told my mom I was thinking of doing this (big mistake - she was horrified). Between her and hubby thinking I lost my mind I stalled. As I look in the hallway at the three laundry baskets sitting in the hallway awaiting their journey downstairs to the laundry room, I'm thinking maybe... just maybe... some of those clothing items don't come back upstairs. 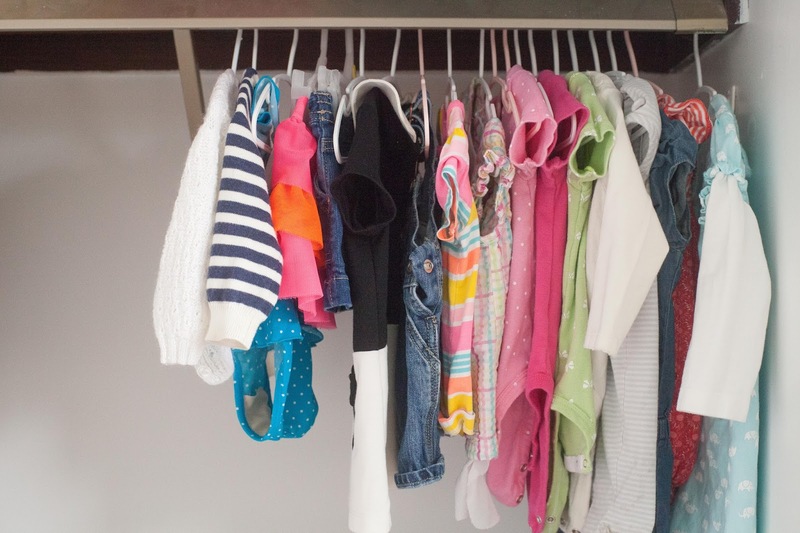 How many outfits total do you have per child? Any other suggestions? I guess it DOES sound a little crazy! Ha! As far as number of outfits, I'm not exactly sure...With 5-7 tops, and 5-7 bottoms, they could technically make 10+ outfits, more if they wore things more than once! (plus 2 church outfits that they alternated, and a couple sweaters for the cooler days.) With kid-accidents and messy mishaps...all those clothes didn't last quite that long, but it was enough! -Keep all pieces generally able to mix-and-match so they can be used in lots of different combos of outfits. -Do one load of laundry (wash and put away) every day. -Begin by deciding on a number for each item of clothing (i.e. four t-shirts) and then pick four of your child's favourite t-shirts out of the mix, put away the rest. 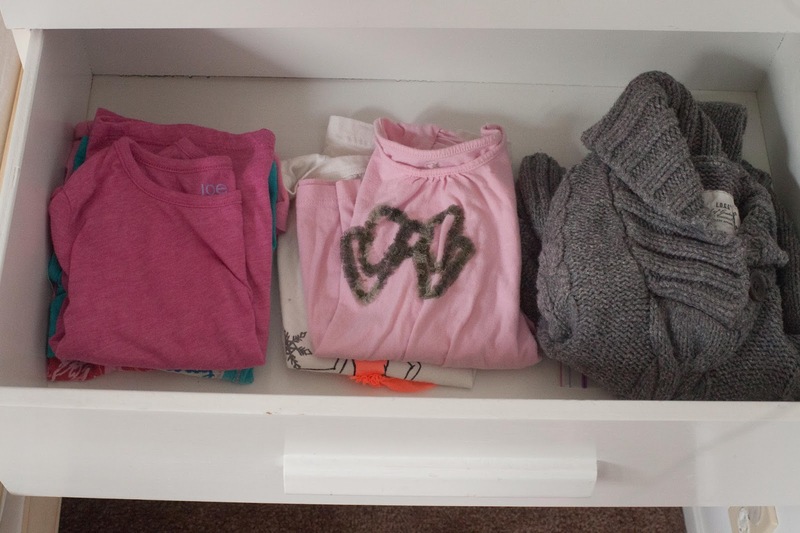 That way you have a pre-determined limit, which helps you decide which four shirts are awesome enough to make the cut...instead of just starting to pull out favourites (with no predetermined number) and still ending up with a LOT of clothes in the drawers. -Initially, just pack stuff up and put it out of sight (in a basement or garage). That way you can still retrieve something if you REALLY miss it. It makes the whole process a little less traumatic...haha! Good luck! If you end up doing it, let me know how it goes! Thanks Laura! I guess I came back to read this advice too late. I actually went through clothes and put all the ones that were quite worn (that aren't favourites) in donation bags. 2 BIG blue bags full of clothes Laura! That's crazy! I knew they had lots of clothes but it wasn't until I started doing this, that I realized JUST how much they have. I could just sit on the floor now with their dresser drawers open and the closet door open and stare at the wonderful work I've done. I feel so much lighter! 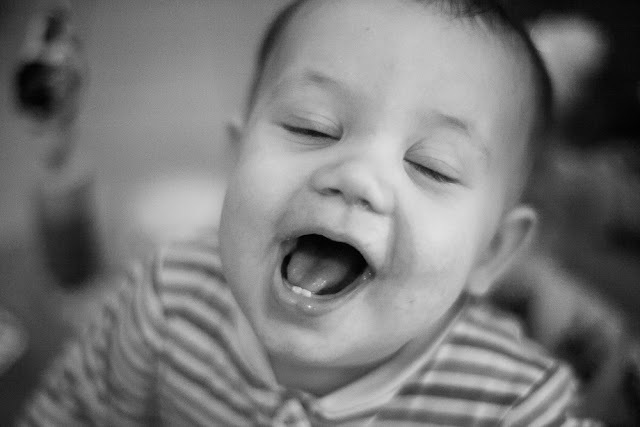 So glad you shared this on the SHINE Blog Hop by the way! I love this and am so tempted. There is a part of me that CRAVES a simpler life of less is more. And I am slowly getting there. I find the closet so difficult. Something happens between my head and what I want and my hands being able to remove something. I read a while back about instead of throwing something out, put it in a box and put it away for six months. Then in six months if you haven't gone to the box to get anything out, then just throw it out. I would probably want to open it to be sure, and this is where it would all go wrong. Ha ha! Thanks for the inspiration!